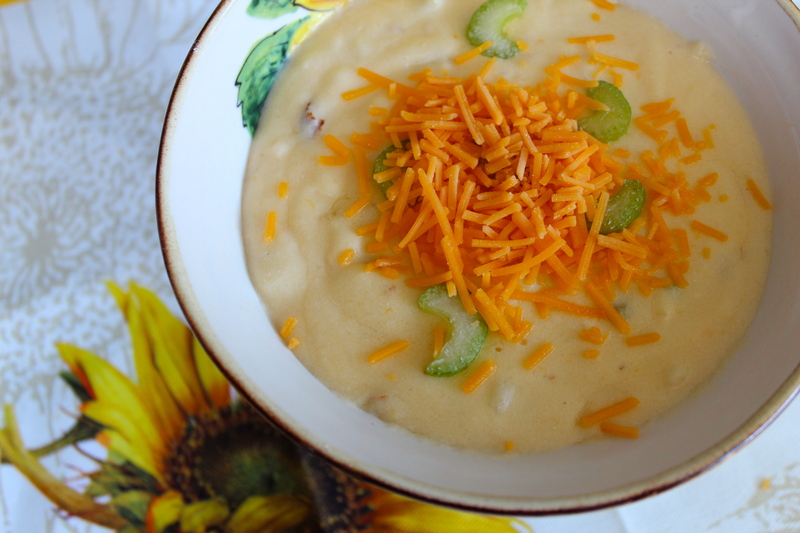 Happiness Project#42: Creamy Chicken Potato Soup! Hallelujah! It’s FINALLY starting to feel a bit like Fall, here in California! Bout time! It actually rained a bit, two days ago and I found myself standing in my Daughter’s room, trying to figure out what outfit to dress her in. A cute jumper? Jeans with a short sleeved shirt? Or jeans with a lightweight long sleeved shirt? Ha! Oh, the many, silly dilemmas of Mommyhood! I finally settled on jeans with a long sleeved shirt, if you must know. Anyhow, to celebrate the wondrous experience of such highly anticipated Fall weather, I was super excited to whip up this new comforts-of-home style Dinner Dish! With chicken. Naturally. Because I’m not ashamed to admit that my household (quite literally) runs on chicken. And peas. Oh, and cheerios too. Must NOT ever forget the cheerios. Toddlers, my friends. Toddlers. Since my Husband is an avid soup lover (whereas I usually am not), I wanted to make this dish specifically for him. As my own way of giving back to him. To show him my love. And my appreciation for the deeply rooted patience he has for living with me. The NOW me. Who sobs uncontrollably (for no discernible reason), more often than not and sometimes, feels completely & utterly broken inside, no matter that I have the kind of beautiful, semi-charmed life that not everyone is blessed with. That’s simply (or not so simply) how depression is. I have good days but also very severe bad days, as well. And it’s something that I can’t just will away. Nor is it something easily explained to those who have never experienced it firsthand. It’s hard. And can be emotionally excruciating, at times. Just being me. The NOW me. The NOW me that affects everyone else around me. My family, my friends but most deeply, my husband. And sometimes, on my bad days, I grieve for him, as well. For the woman he married and now is gone, in so many prevalent ways. Tangled up so tightly within the deep heaviness of this life change. For both of us. And even though, things will never be the way they were before & I will never be able to give back to him that once unaffected heart & body (the me of BEFORE), the NOW me is determined to show my love & appreciation for everything that he has given, in other ways instead. Like through this recipe. This perfect LOVE-in-a-Fall-Soup recipe. So let’s celebrate, my friends. Lets celebrate the coming of Fall and all of the many ways we share Love! Bring on the soup! *1/2 cup finely chopped celery (approximately 1 whole celery stalk), for garnish. Optional. In a large stock pot, melt the butter over medium heat. Whisk in the flour and let it cook together for 2-3 minutes. Add in the 6 cups of milk, 1 cup at a time, whisking well between each addition. Let the milk mixture sit and thicken slightly. Drop in the cubed potatoes, bringing the pot to a boil, while continuously stirring, for 2-3 minutes. Reduce the heat to the lowest setting and stir in the cubed chicken, mixing well. Followed with the cheese, sour cream, salt, pepper and paprika. Stir gently until well mixed. Once the cheese has melted, serve and garnish each bowlful with celery (which adds a nice crunch to the overall dish, as well as a bright pop of color). If you prefer a more thickened overall texture, let the soup stand and cool until it has reached a desired consistency. Chicken. Potatoes. Soup. How could you not want a little bit of THIS comfort food?? « Happiness Project #41: Chicken & Broccoli Shells!